i have been on a shoe mission for about a month. i have a pair of red strappy heels that i can wear to fancy places, like wine and roses and weddings, but that’s the extent of my red accessories. meaning, if i wanted to add any other sort of color into a fancy outfit, i really have nothing. obvs i’m not finding much in person. finally tonight, i went to ask the internets, aka amazon, to see what they have for me. 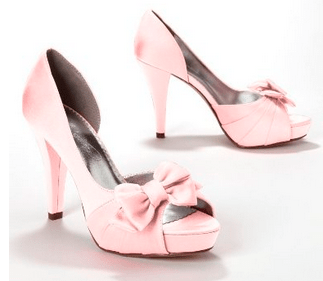 – bridesmaid shoes. should’ve guessed. it’s a 4″ heel, but my red shoes have a 4″ heel so i’m not too concerned. plus they run a 1/2″ too small, which means i could get my ideal size 10-1/2 shoe. so much time wasted trying on shoes when i could have just gone to amazon in the first place. I think depending on the shade of pink, it would be okay to wear with red shoes.